The ability to do things on the go – email, tweet, listen to a podcast, find a restaurant or ATM – are things we all do all the time, as adults. This instant access to the Internet and apps allows us to be more productive with our time and make better decisions, just using the little computer in our hand. Schools are increasingly embracing mobile technology in the form of tablets and notebook computers, and this is changing the way we think about education and offering more opportunities for learning with mobile devices. And the benefits are real. Giving kids instant access to the web and apps can make the world their classroom, teach them real world skills alongside the curriculum and enable a more collaborative environment for their work. And, access to tablets is a much more affordable and durable option than laptops, the previous model of 1:1 access. Also, personalized education is a big buzzword in the industry, and mobile devices offer an unprecedented level of individualization for learning tools. And perhaps the most important benefit for the students: tablets are inherently cool. The engagement factor is a huge perk, and any way to draw in students who aren't naturally engaged is a good thing. As more schools adopt these devices, we are learning more and more about how they impact the learning and possibilities. Teachers are also learning as they go, and our new book, Mobile Learning: A Handbook for Developers, Educators and Learners, aims to provide a road map for effective conceptualization, implementation and use of these devices in education. It also provides details for developers in how to create quality educational content and navigate the unique marketplace for educational apps. 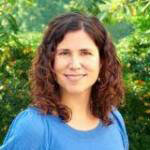 Teachers and developers working in collaboration is a key element of a strong mobile learning marketplace, which is no surprise, as we are part of just such an interdisciplinary team at Curriculum Pathways. In our book, we advocate for the thoughtful incorporation of mobile devices, not simply retrofitting old lessons and adding an iPad, say, to replace a worksheet. Mobile devices can add a level of engagement and learning. For instance, in a non-technical classroom, students might sit in class and learn about plant life cycles; the teacher would have handouts and maybe a presentation with pictures. However, using mobile devices, this lesson could involve students going outdoors, taking pictures of different plants and identifying the plant and its stage in the life cycle, and maybe even creating and sharing online an ebook to explain. Adding mobile devices, in this example, adds a level of creativity, physical activity, collaboration and engagement that isn't attainable through a classroom lecture and worksheets. We see examples like this everywhere: “there’s just something about these devices” is one of the most common sentiments we heard from the teachers we interviewed in writing this book. We aimed to break down what makes them special to kids and promising to educators, using educational theory and pedagogy. There are certainly controversies and drawbacks, all of which are addressed in this book as well – data privacy, screen time limits and digital citizenship, to name a few. However, we see the incorporation of mobile devices into education as an exciting and promising development, and when done responsibly and intelligently, a way to teach all students in a way that more closely mirrors “real life.” Our book presents a practical look at the latest in learning technologies. From theory to practice, Mobile Learning is a great start for any school or development team looking to get in the mobile learning realm. 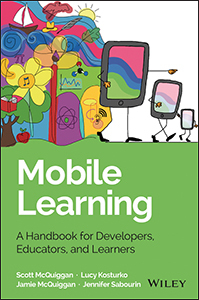 To learn more, check out Mobile Learning: A Handbook for Developers, Educators, and Learners by Scott McQuiggan, Lucy Kosturko, Jamie McQuiggan and Jennifer Sabourin.